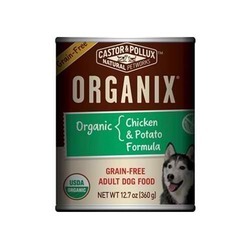 95% certified organic ingredients like chicken and potatoes served in a loaf or pate-style bring a lifetime of complete and balanced nutrition to your dog. ORGANIX is good for your dog, and good for your peace of mind.Why serve canned food to your dog?Variety is the spice of life! Canned foods are a simple way to add new flavors and allure to a complete and balanced kibble diet.Great for dogs recovering from illness or injury, and needing to gain back lost weight. More calorically dense than kibble and easy to digest, canned food lets your dog easily add needed calories and nutrition without adding a lot of volume.Encourage finicky eaters or senior dogs to eat a complete and balanced meal. Just add a spoonful of wet food to your dog's normal kibble meal. Mix well and then warm to enhance the aroma and flavor. The moisture from the wet food also brings out the flavors and aromas inherent in the kibble.But remember: Wield a light spoon. Don't overfeed! Canned foods are more calorically dense so watch your dog carefully for any unwanted weight gain and adjust the feeding amount as necessary. Also, many dogs are quite sensitive to changes to their regular diet, even when the changes are positive, like stepping up to a new kibble formula, or adding canned food to encourage eating. To eliminate unwanted surprises (such as loose stools), slow and gradual is a good rule to follow when altering an established diet.